Imagine a day at the office without an aching back and neck. It’s possible with the Stressless Atlantic office chair. With the help of advanced Comfort Zones technology, your body will immediately feel supported in this chair for ultimate comfort. The internal Plus and Glide systems ensure you receive personalized support as they adjust to align your back and neck in any position. The wood accents, 360 swivel, and sturdy wheels make this polished chair a crucial piece for any home or office. With strong endorsement by the American Chiropractic Association, this chair helps reduce back pain associated with sitting so you can focus on your work. Boost your productivity in the office with a supported back and neck thanks to innovative Plus and Glide technologies. Comfort Zone technology ensures you experience the perfect balance of cushion and support the moment you sink into its seat. Move throughout your office with ease with a 360 swivel and durable wheels. The Atlantic Office (M) is perfect for individuals of average height and stature. Ekornes Stressless office chairs are proudly endorsed by the American Chiropractic Association. Give your back and neck a break by offering it the support it needs in your office. 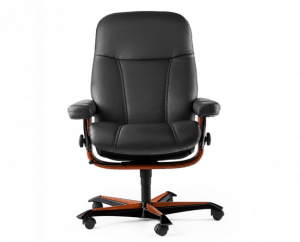 The padded armrests, smooth leather, and soft contours of the Atlantic Office (M) are a welcomed addition to any office. Improve your productivity and protect your back when you buy the Stressless Atlantic Office (M) chair. We ship to any address in all 50 United States. Ask for details regarding shipments to Canada. For quality assurance, all Atlantic Office (M) shipments must be insured for accident, loss, or damage. Once your shipment leaves our facility, a tracking number is provided via email. Unless otherwise stated, delivery means “to your door”. Shipments must be signed for by someone over 18 years of age.